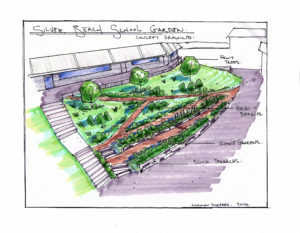 The Silver Beach Elementary Garden, established in 2014, is located adjacent to the playground and is made of two raised, terraced beds on the grassy slope that connects the playing field to the school building. Though it is small, it is in a sunny location and has been productive enough to provide snacks during garden classes. Garden production is focused on annual vegetables with several perennial herbs, most notably rosemary and lavender. 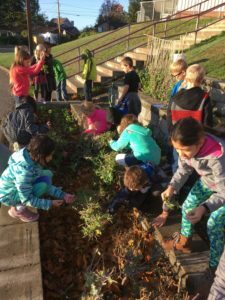 Silver Beach Elementary would like to expand the garden and create a larger composting system, as there is interest from within the school community. 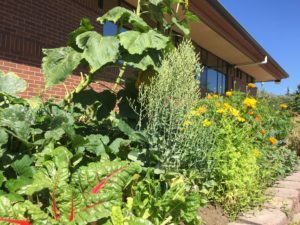 Silver Beach Elementary School garden has approximately 160 square feet of growing space. It is located at 4101 Academy Street, Bellingham WA 98226-4443. If you’re interested in getting involved, Silver Beach Elementary has a Common Threads Facebook Group that you can join!